It's been awhile since I've put together a God Box on Sunday, but a whole lot has been said over the past few weeks in regards to the religions of our Presidential and VP candidates. So I figure, what a better time than any to tinker around in this tool box. The US Constitution reads Freedom of religion and not necessarily Freedom From Religion. One can choose a religion to follow, change religions or even decided not to follow any religion at all. But is this really the case? Our government sure has been busting up some religions lately. From the Mormons who practice bigamy and the marriage of teenage girls to the Rastafarian who cannot smoke marijuana in order to reach enlightenment by meditation. From where I'm sitting America allows freedom of religion as long as the religion doesn't.... oh, I don't know... dare to vary to far from the Christian Church and their beliefs. Basically America seems to be giving us the Freedom From Religion rather than of. Except if the religion is fundamentally Christian - you won't ever be protected from that. I'm a Christian and I shouldn't be having issues over this at all. Yet I do. Sure, I do like the fact that our Government protects the innocent teenage girls in the Mormon complexes and cute little bunnies from being sacrificed to Satan. 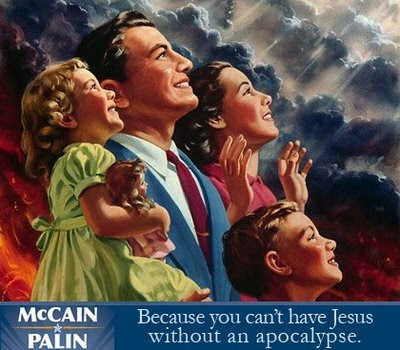 It doesn't bother me that Sarah Palin is a Fundamentalist, prayer partner, pro-lifer Christian Zionest. May God bless her and her wonderful family. However, my finger is going to hover with dismay over the McCain/Palin button wondering whether while in office will her political decisions represent her people or represent her God. What if she freely converts to FSM, tosses the 10 Commandments and replaces them with the eight "I'd Really Rather You Didn'ts" like Obama seems ready and willing to do? This nation isn't and never has been Christian. It had political values. Not smoking pot is not a Biblical command it is a practical political decision as are laws protecting young girls. When practical politics run into any religion the religion always loses. Very valid point. Thankfully I'm here in Australia where we tolerate each other because we have to.. and kinda want to. That bottom picture is very lulzy. I approve. There is a problem in wanting to elect someone to make laws making people behave as Christian because we come into Gods kingdom by grace because we can't obey the laws[Gods laws].God's thoughts and our thoughts are far apart. Everyone should be free to practice their religion, though I think there should be some exceptions - like the nut cases who invent their own special religions to suit their needs. Religion should be a private matter when it comes to politics. So that's where Orhan got the picture from...well Margie I think I can take all the credit away from his hairy arse and put it on your not-hairy arse. Well played, and I approve as well.